Isn't it amazing how a recipe gets around the internet? 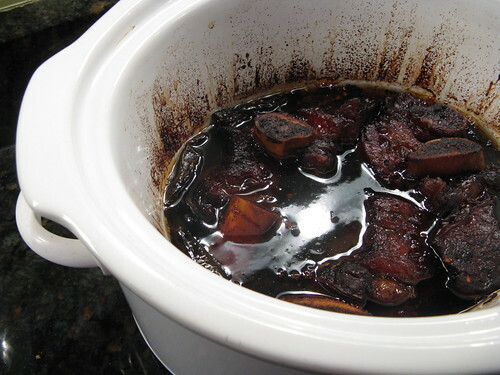 I found this recipe for Korean Short Ribs on Dinners for a Year & Beyond, she found it on A Year of Crockpotting, who had gotten it from City Mama. It's also interesting to watch how it changes. City Mama made it as a stew with beef chuck then on Crockpotting it became beef or pork ribs. The other thing I noticed is everyone uses a different amount of jalapenos. Maybe its just me, but I love seeing how a recipe like this develops from person to person. Anyway on to the ribs. We loved then! After six hours of cooking slowly in the crock pot they were so tender the meat was almost melting & look at that beautiful rich shiny color. The salty/sweet sauce couldn't be any easier since its just soy sauce, brown sugar & jalapenos. We actually think the sauce might be better a little less sweet so next time I'm going to try cutting the sugar down by at least 1/4 cup. I only used 3 jalapenos in the recipe because that's what I had left in the garden, next time I'm bumped that up to at least 6 a little more spiciness would have been a great against the sweet. Drizzle the ribs with a little olive oil. Heat a large skillet or grill pan over medium-high heat. Sear the ribs on all side. Place the ribs in the crock pot. Mix the sugar & soy sauce together & pour over the ribs. Add the whole jalapenos. Let cook on low for 6 hours. This was great served with some rice & the sauce from the pot poured over both the ribs & the rice. Matt wants to try it next time as a stew using a cheaper cut of beef, we figure this type of cooking will make any piece wonderfully tender. 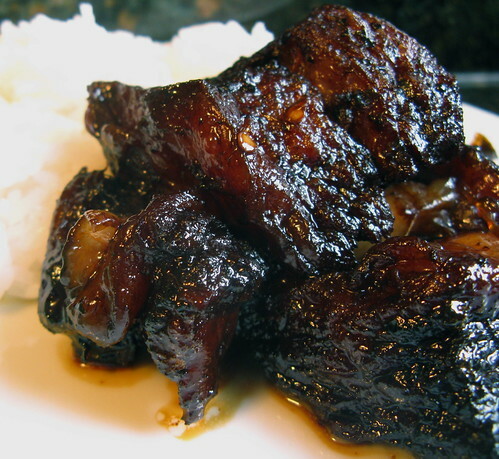 I love Korean short ribs (kalbi) and I think I'll go out for them this evening...they're so damn good! I am not a rib eater but I am sure my hubby would dive right into these!! This looks absolutely scrumptious! Look at the luscious shine -- wow! We usually have Korean short ribs grilled (because only the flanken cut are easily available), but I'll try braising them next time. Lots of sauce for the rice. do you think you could use splenda brown sugar instead of regular brown sugar? I've got a slow cooker cookbook that has a recipe for Korean short ribs that I've wanted to try - I wonder how similar it is to this one. I'll have to check. But these look DELISH! My crockpot broke earlier this year and I miss it. Such an easy way to prepare amazing things like this. I'm drooling ... good job! I also love to see how recipes evolve on the blogosphere. I've never had Korean short ribs, but now I want to try them. After making this recipe only once, it has become a favorite at our house. We liked the heat of the jalapenos and the sweet and salty of the soy sauce and brown sugar. Thanks for the link!! You photos look great. I love seeing a recipe travel! 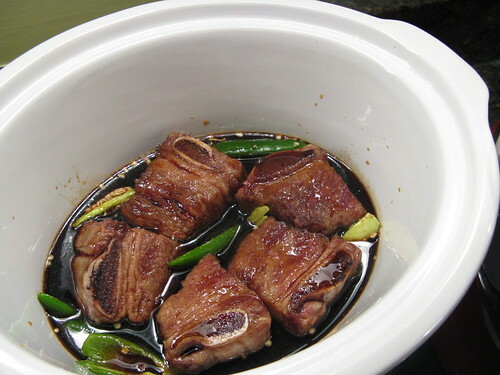 I have another recipe for Korean braised shortribs that is similar to this--will post it on CityMama soon. I usu use a "pot roast" cut of beef for this because it does get so incredibly tender it's nt worth using expensive short ribs. And I use LOTS of jalapenos--the stewing process seems to take some of the heat away. Even my kids LOVE this.